PLEASE READ : In these last two weeks, I was extremely busy. Also, this game was not made with a visual game engine, it was made with an Actionsprit 3 framework called Flashpunk. I was learning Flashpunk back then. Also, sorry for its length. I hope you can understand it. A game about important life choices. If you can' t eat a thing that will be good for you, what will you do ? Will you try to eat it ? Will you eat the unhealthy red 'n commie McDonald' s broccoli ? Or will you escape ? Choose one of these... but one of them is worse than the other. One is good. It has also a part in which you cannot control yourself. That depends on you, though. - All the characters from the first game, plus a few more. - An advanced upgrade system (For KnP standards, at least). - Cookie Clicker-like hiring system. - Too many fruits 7.8/10. - 10 to 15 minutes worth of gameplay on a single frame. Mouse used to control everything. You can press F1 for instructions on how to play. But for the proper experience i recommend you figure things out yourself as they appear. You are CAPTAIN STARRUFF, klipart ship pilot extraordinaire. You are the commander for the space station, DINGWED, around the planet POOLYTEXTURED-SORRY. Everything was fine until one day while you were scouting out a new area of the planet, FVIL EACE attacked and destoryed DINGWED with his wormy army of APPLE CLONES! You are humanity's last resort to defeat FVIL EACE once and for all, CAPTAIN STARRUFF! You only have 100 SPACE SECONDS* to do so before the weight of the clones creates a black hole! May the power of klipart be with you! Use the ARROW KEYS to move your ship around when it exists. They do nothing otherwise so don't bother wasting your time pressing them. At any time you can hit ESCAPE to end the game, and forcing CAPTAIN STARRUFF to launch himself out of his ship and catch onto a passing star to reach earth before FVIL EACE and warn them of the danger. The latter is not shown because the animation budget ran out. 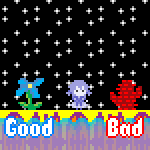 This is the first game I ever made in anything besides Game Maker, so don't expect anything super. Mouse to move the basket. Catch apples in the basket. The game doesn't have an end, so just play until you're bored. The frame rate is capped at 60 fps, without that the apples will go too fast/slow. If your frame rate is below 60 for some reason, the game won't work how it is supposed to. As some of you are probably aware, it is now legal to jailbreak your iPhone. This is really good news, because it means that it opens up the market for others who don't want to go through Apple's inane App Store approval process. But Apple's response filled me with rage, so I made this game. Press Shift a bunch to start the game. Hold Shift to accelerate your droid, and then hold Shift after that to decelerate, then hold Shift to accelerate again, and etc. Your droid will turn clockwise when you are not holding Shift. The objective is to ram into Steve Jobs without hitting the walls or any App Store restrictions. Oh, this is also my second trainwreck made in Linux, this time using MMF2, so Windows and Linux users alike can enjoy (without having to change process affinity)!